Refer two friends--Get your next visit FREE! As with most injuries there are two ways to deal with ankle sprains. There is the quick solution that will get you through if you’re in a bind and there is the other fix that will take a little time, but will be a permanent resolution. Let’s say you sprained your ankle a few years ago. It wasn’t “bad.” No bruising. You could walk on it within a few hours. After icing it and wrapping yourself with an ACE bandage, you felt okay within a week or so. Sure, maybe your ankle didn’t bend quite as far anymore, but you could get around and perhaps return to your sport without major problems. 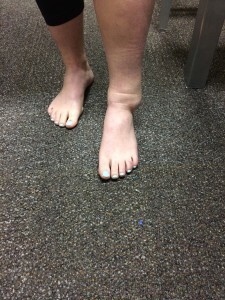 As time went on, you would “tweak” that same ankle. You’d go through the same process of icing, wrapping, rest and then returned to your lifestyle. Of course, each time this cycle occurred, you lost a little more of your flexibility and a little more of your stability in that ankle. Now you are starting to have pain in the bottom of your foot and along the Achilles tendon. You go to the sports chiropractor. We take a look at the situation at hand. You now have very limited flexibility at your ankle. There’s so much scar tissue built up around the injured ligaments that it is going to take some deep tissue massage/mobilization to break it up. Your muscles that control the foot and ankle are so atrophied from the repeat sprains that it’s difficult for you to even stand on one foot for more than 5 seconds. We begin to teach you how to use those stabilizing muscles in the foot and about 8 weeks later you’re able to walk without the pain and finally can balance enough on one foot to put your pants on without sitting down to do it! What happened here? 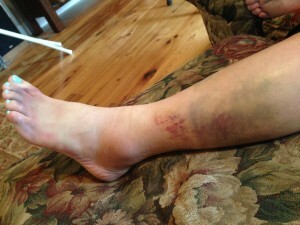 I thought ankle sprains were no big deal, right? After your body sustains a sprain injury, there are small tears that occur in the ligaments and muscles that support the ankle and foot. Immediately after you hurt yourself, the body starts to put down a “quick fix” of fibrosis, or scar tissue, along the injured spots to help you get back to walking. The problem is that this scar tissue is not as strong as the original material and also doesn’t have the flexibility to allow for normal motion. If you don’t gently break down that scar tissue right away and prompt your body to put down good materials through deep stretching, balance exercises and mobilization of the area, the scar tissue keeps piling on and it makes it easy to hurt the area again. So the next time you sprain or “pull” something, think about the quick fix and the quality fix and decide which one you want. You might start taking those small in juries a little more seriously! Give us a call (801)-893-1010. Your Next Appointment is FREE when you refer 2 friends! Ask Your Friend to Mention Your Name When They Come In!